On the 2nd of September (now) I checked the Stats Center for September 2014 of Air Danubius. The worst landings were done by GG with a -737 fpm and a -571 fpm. I have nothing against the -571 fpm landing, but the -737 fpm should be invalid. Top distance pilots show GG with 36'237 nm...in 2 days!. 18'118 nm per day?!? How is that even possible? A 4'000 nm flight takes about 9 hours of flight. So he flew 40.5 hours every day(!!!). But there's more. Top flight time pilots shows GG with 50 hours flown, out of 48 (!!!). Furthermore, 36'237 nm in 50 hours means a mean GS of 724 knots (!!!). 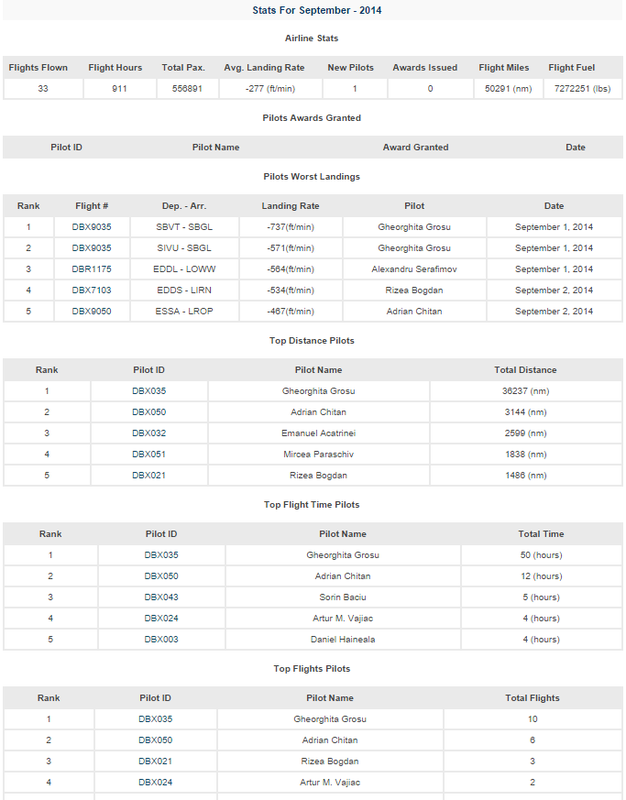 Top flights pilots shows again GG with 10 flights. So about 3'623 nm per flight. While this distance is possible for a long haul pilot, it cannot be done in 2 days! So who is Gheorghita Grosu? He either has a badly configured kACARS client or he flies the F-22 in SuperCruise with lots of aerial refueling. From time to time he gets very close to the speed of light to account for the 25 hour day he's showing in his stats. And STOP accepting super hard landings! I know I'm a pain in the ... but I stopped liking arcade games when I was in the fifth grade . Man, i never laughed so good in a while. You are right Adi something is wrong. I will bring into attention of the pirep acceptance person. Anyhow this month we are implementing the new Career Mode with stricter rules and the pireps will be heavily dissected before acceptance. These days we will release a Danubius Pilot Handbook that is almost done and where everything is explained.